I can play the ponies at Saratoga, Aqueduct and Belmont. I can also play the ponies at Calder, CharlesTown and Mountaineer. I can also play the ponies at Delta Downs, Beaulah Park and Suffolk Downs. What's my point? Any racetrack, no matter what the condition (or uncondition) it's still provides an opportunity to prosper and make money! It's all about making money, right? If Ben Hur was 4-5 odds, you would put him in your triple wager, right? Us horse players know what it's like when your at the track and your not doing so well, you may turn to the simulcast wagering to try to change your "luck". Hey why not, sometimes we pick winners at these "other" tracks and sometimes the races may be easier to handicap as well. Maybe we don't include many statistical factors when handicapping a simulcast race. Either way, it's an opportunity to make money...big money. When I compiled my systems I used all sorts of tracks to calculate my win percentages and to perform the actual testing of the horse racing system itself. Some of my biggest hits were from Charlestown and Arlington racetracks. We all play the ponies to make money so why not own some racing systems that can be applicable to all thoroughbred horse racing tracks? My intentions were to create some high percentage horse racing systems. Now that I have them I can go to any type of track and not worry about having in-depth knowledge of that particular track such as top jockeys, fastest time(s) of the assortment of races, trainer percentages, dirt or poly track surface, stretch run variants, etc. Horse players gamble at any type of track which is why it is important to have an edge. Your handicapping knowledge is one type of advantage but when your betting at uncharted "territories" it's good to have the racing system(s) advantage. For those of you who remain skeptical, and I do not blame you, this book has received an 8 rating from Phillips in March 2007. This credibility regards these systems as viable and valuable resources to add to your handicapping knowledge. Please review some of the exotic wagering examples I had posted. Finding a winner is just part of the process, now you need to know how to properly wager for your best returns. Just recently I had a $205.00 horse (see First Golfer) to win and place. My front runner system also gave me the exacta. I should have played the double and the triple, but I did not and obviously I would have cleaned up if I did. But that's horse racing. It is surprising to admit that a lot of horse racing systems work better at the minor race track circuits more often, as opposed to the major outlets such as Saratoga, Belmont, Santa Anita and the like. In fact, I prefer to apply my gambling strategy at a course where each race is usually and continuously filled with numerous long-shots in unusually very large fields. As I mentioned earlier, "particular" racing tracks were not intended when I researched the integrity of each angle. 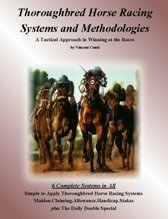 At any conditional racetrack, this book "Thoroughbred Horse Racing Systems and Methodologies" can easily be applied. Both superior and inferior tracks are welcomed by my book. As long as the methodology is applied correctly, you can find a winner at any track. Winning Trainer: Capuano Nicholas - Owner: Steinbuch, Jr. William M.
The winning results for each method printed in this book clearly shows the diversity of the race tracks that I had used for my research. Afterall, being in New York I was limited to the simulcast tracks and of course the New York based tracks. However, I visited casinos, horse parlors and frequently went to the track to research and refine these money making racing systems. Horse race tracks are filled with people who are enthusiastic about winning but more importantly it's about the enjoyment and excitement of watching the horse you picked come thundering down the final furlong to win the race. Imagine the excitement when applying a horse racing system, betting on the horse that the racing system points out as the probable winner, and having your family and friends ride your coat tail to the winner's circle? Now you can with my horse racing systems at any horse racing track. Each system was tested throughout the North American tracks. Win percentages were based on the total of win/loss ratio over a period of one full year. NOTE: Harness racing cannot be subjected to these systems with only one exception: The Stakes Racing system. This system can be applied to harness racing and the flats. "Six different horse racing systems and strategies for winning at any race track, horse parlor or casino." ONLY $24.95 for all 6 systems ... FREE SHIPPING!